It’s okay, I got rid of the quiff, look! Now, I’m sure you’re all as sick of the sight of my face as I am right now, so this’ll be the last FoTD for a few days, I promise. 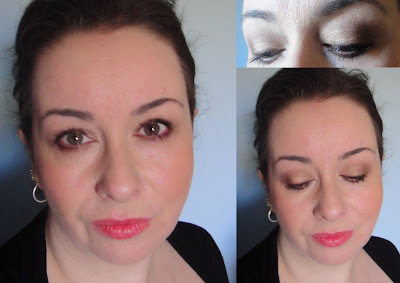 I created a slightly more traditional take on a smokey eye with this one – the colours were a fair bit darker in the flesh than they appear here, and there’s a lot more gold visible on the skin than my camera can pick up, it seems. The Cream Eyeliner in the quad has a lot more gold than expected, and it’s not quite as creamy as I’d like it to be, meaning it’s slightly claggy to apply, but it’s a very nice colour indeed, and worth the slightly painstaking application process. Incidentally, don’t even bother using the eyeliner brush they give you in the palette, it’s very small, and combined with the not-very-smooth liner, you’ll be applying it for hours before you get a visible line. Oh! Can’t believe I forgot to show you this when I showed you the palette the other day! This is the lipbalm that also forms part of the Clarins summer collection. Isn’t it pretty? Something to do with jellified oils and, polymers and, er … something, but it’s basically a clear – literally – lip balm, and it’s very very nice. It’s not a particularly fantastic lipbalm (you’ll have to prise my Sisley Nutritiv from my cold dead hands, frankly), but it is a fantastic looking lipbalm, and as such, it has a place in my Lip Balm Hall of Fame. I’m wearing it in the pictures above, if you’re wondering how it looks applied. A very soft, gentle wash of slightly glossy colour. There’s also a red and a pink version, but the orange is the most pigmented, I found. I may have to sneak back and get the others too. So, that’s three summer collections I’ve shown you in a great amount of detail now, what’s your favourite? Previous Post Get A Movie Star Hair Cut! Wow, I would buy that lip balm just to stare at it in the tube, and not use it XD it looks so cool!